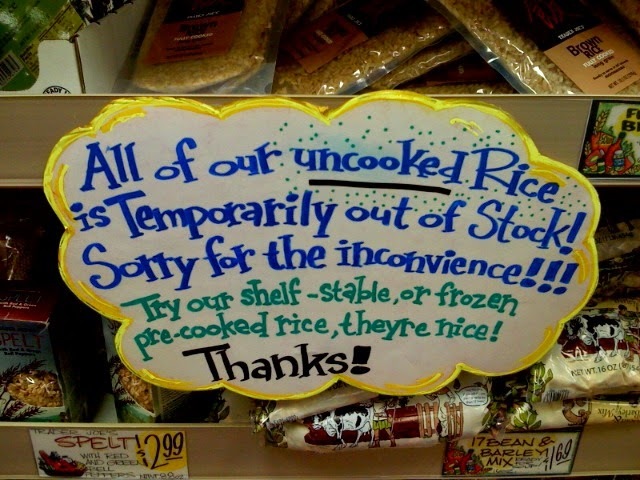 Mental Bang: Friday Research: Could "Out-Of-Stock" Be Another Trick In Your Marketing Book? Friday Research: Could "Out-Of-Stock" Be Another Trick In Your Marketing Book? Planning and developing marketing strategy for your products. Smart companies might have noticed that sometimes consumers more desire those products that are "currently unavailable". Imagine a man called Peter who goes into a store to buy an iPhone. He comes directly to a salesperson and asks for the specific model of iPhone. Unfortunately, a salesperson informs that the desired model is out of stock. Now, there are a few possible ways Peter might react to this information: he might desire that iPhone model even more (increased product desirability) or he might feel frustrated with the store (increased source negativity). Current research* examines how consumers respond when formerly unavailable products become available after being out-of-stock. To qoute the authors, "we examine what happens when consumers’ freedom of choice is restricted and subsequently restored." Before we go deeper into the studies, it's important to note what authors describe as high and low reactance individuals, that is "individuals who are high in reactance (e.g., young adult males) respond very strongly restrictions of their freedom of choice, and experience strong product desirability in response to stockouts. Individuals who are low in reactance do not experience product desirability in response to stockouts. However, both high and low reactance individuals respond to stockouts with source negativity toward the store." It is interesting to go through all the studies in this research, designed to investigate the restoration of freedom. "Study 1 used a shopping scenario. Individuals imagined going to purchase their favorite snack food at a local grocery store. In the control scenario, they purchased the item and left the store. In the stockout scenario, the item was unavailable and they left the store. In the restoration scenario, the item was initially out-of-stock, but had been restocked when they walked back through that aisle on the way out of the store. After these scenarios, we measured individuals’ satisfaction with the store and the snack food item, and measured their individual levels of reactance. As anticipated, compared to the control scenario, in the stockout scenario, all individuals were dissatisfied with the store, but high reactance individuals also felt more positive toward the unavailable (desirable) snack food item." "In studies 2 and 3, individuals went on multiple shopping trips using a computer-based shopping interface, and chose jellybean flavors from different stores. To make the study realistic, they received their chosen jellybeans. On the restoration shopping trip, individuals were told that the store was out of their favorite flavor, and they would not receive that flavor on the current trip. They were told they would have to make a second choice, but at the last minute, the shopkeeper discovered some additional stock of their preferred flavor. We compared individuals’ satisfaction after this restoration shopping trip to a control shopping trip where they received their favorite jelly beans immediately, and to a stockout shopping trip where they did not receive any jellybeans. We again measured individual levels of reactance. As before, high reactance individuals were more satisfied with the store after the restoration shopping trip than they were after the control shopping trip; they were also more likely to return to the store on a subsequent shopping trip for jellybeans. Low reactance individuals showed the opposite results." "Study 4 examined how individuals high and low in reactance respond to restoration of freedom when they receive different reasons for the initial stockout. Individuals imagined shopping for jellybeans. In the restoration conditions, they told that their chosen jellybeans were out-of-stock either because the store failed to order jellybeans last week, or because the jellybeans were popular. In both cases, as in the prior studies, their chosen jellybeans were later discovered, and they received these. Compared to a control shopping trip, as before, low reactance individuals responded negatively to the restoration shopping trip—regardless of why a stockout happens, low reactance individuals dislike stores and products after having their freedom restricted and then restored. As before, high reactance individuals responded positively to restoration of freedom in the product popularity condition. In contrast, however, they responded negatively in the store failure condition—this condition strengthened their negativity toward the store, overwhelming their positive desire for the jellybeans." Passing by and thinking, is this really out of stock or they need to push other products too? "Only a few left", "Disappearing fast", "Stock for 1 day only" and similar selling slogans have been used as a strategic tool in many companies' marketing. This research confirms that "some individuals (those who are high in reactance) are happier to experience a temporary stockout than to have an uneventful service encounter. In short, high reactance individuals reward firms, but low reactance individuals punish firms, for restricting and restoring their freedom." Carefully used (not over used) scarcity marketing can be great. Creating campaigns for a limited amount of customers or valid only for a limited amount of time can beautifully boost the sales of your products. Be creative! P.S. When you’re done reading, I’d love for you to share your experience with customers' reactions to "out-of-stock"? Leave a comment or Tweet me, let's chat!